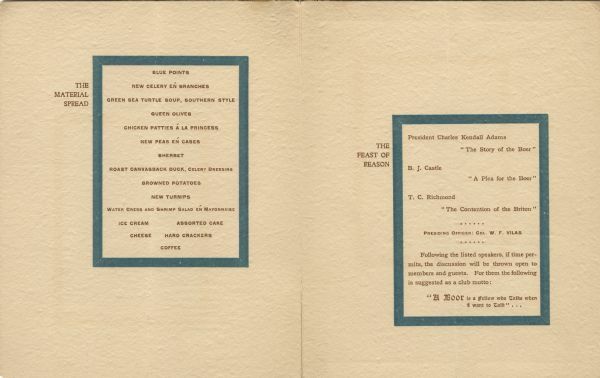 Interior of the menu for the first dinner of the Six O'Clock Club, with the menu ("The Material Spread") and the program ("The Feast of Reason") in teal borders. The Six O'Clock Club was a men's social and dining club, centered on topics of political and civic interest. For the exterior of this menu, see Image ID: 103802. For other Six O'Clock Club Dinner menus, see also Image IDs: 102830, 103636, 103640, 103723, 103782, 103784, 103797, and 103798.